A residential house in the Craftsman architectural style. The Craftsman style structure emerged from the Arts and Crafts movement of the early 20th century, a philosophy which stressed comfort and utility through the use of natural materials and a lack of pretension. 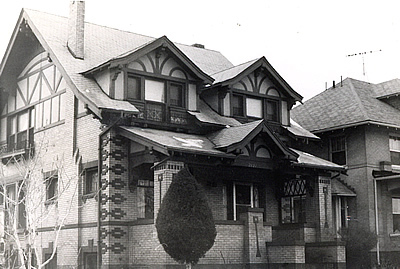 An example of the Craftsman architectural style in Denver. 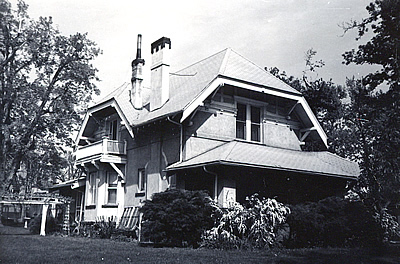 Exposed rafter ends, overhanging eaves, clipped gables, and large porch columns replaced the more delicate and intricate detailing of the Victorian period. In addition to these characteristics, windows consisted of divided lights in the upper sash and a single light in the lower sash. Some Craftsman houses display a small amount of false half-timbering (not to be mistaken for the Tudor Revival style which has significant amounts of half-timbering). 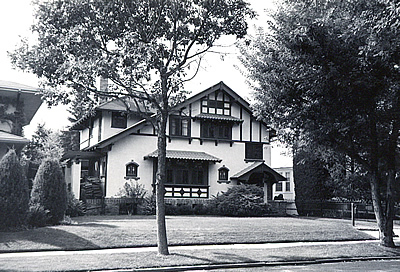 A Denver example of Craftsman architecture. Confusion may result between the Craftsman style and the Bungalow form. Bungalows are one to one-and-one-half story houses which most often employ the elements of the Craftsman style. The Craftsman style may be utilized on any size building and is often found on apartment buildings as well as houses.